Ashworth, John H. The Saxon in Ireland; Or, the Rambles of an Englishman in Search of a Settlement. London: John Murray, 1851. Balch, W[illiam] S[tevens]. Ireland As I Saw It: The Character, Condition, and Prospects of the People. NY: Geo. P. Putnam, 1850. Bennett, William. Narrative of a Recent Journey of Six Weeks in Ireland, in Connection with the Subject of Supplying Small Seed to Some of the Remoter Districts: With Current Observations on the Depressed Circumstances of the People, and the Means Presented for the Permanent Improvement of Their Social Condition. London: Charles Gilpin, 1847. Besley, Timothy, Stephen Coate, and Timothy W. Guinnane. “Understanding the Workhouse Test: Information and Poor Relief in Nineteenth-Century England.” Economic Growth Center Yale University Center Discussion Paper No. 701 (1993): 1-32. Bostridge, Mark. Florence Nightingale: The Making of an Icon. NY: Farrar, Straus & Giroux, 2008. Boucicault, Dionysus Lardner. The Dolman Boucicault, with an Essay by the Editor on the Theatre of Dion Boucicault and the Complete Authentic Texts of Boucicault’s Three Irish Plays [The Colleen Bawn/Arrah na Pogue/The Shaughraun]. David Krause, ed. Dublin: Dolman Press, 1964. Boylan, Ciara. “Famine.” Princeton History of Modern Ireland. Richard Bourke and Ian McBride, eds. Princeton: Princeton UP, 2016: 403-424. BPP [British Parliamentary Papers] (1842). “Gaols: Copies of all Reports, and of Schedules (B.) Transmitted to the Secretary of State, pursuant to the 24th Section of the 4th Geo. IV. Cap. 64, and 14th Section of the 5th Geo. IV. Cap. 12. (Counties, Ridings, or Divisions.)”. H.C. , vol. 32, 1-254. BPP (1851). 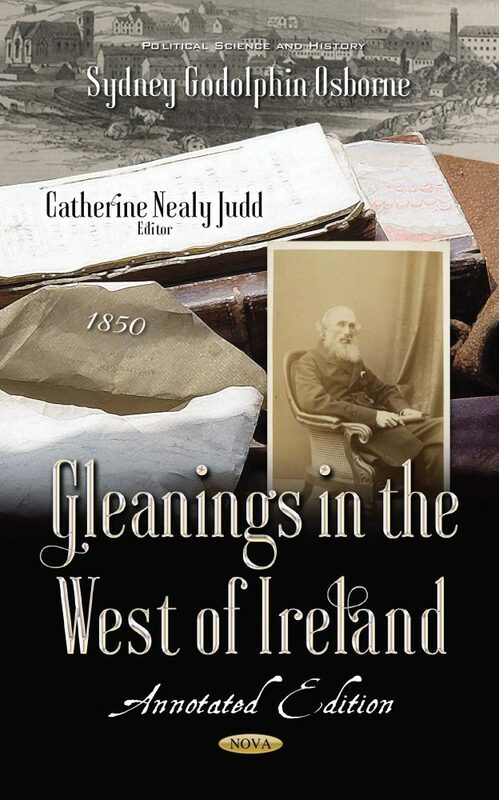 “Gleanings in the West of Ireland: Copies of the Correspondence between the Poor Law Commissioners of Ireland and their Inspectors, relative to the Statements contained in an Extract from a Book, entitled, ‘Gleanings in the West of Ireland.’” H. C. , vol. 19, 209-262. BPP (1851). “Gort Workhouse: Copies of the Correspondence of the Poor Law Commissioners of Ireland with Captain O’Brien, late Temporary Poor Law Inspector, Mr. Richard Bourke, Poor Law Inspector, and Hon. and Rev. S. G. Osborne, in reference to the Statement made by the latter, in a work, entitled, ‘Gleanings in the West of Ireland,’ as to the Punishment of Women in the Gort Workhouse.” H. C. , vol. 19, 263-270. BPP (1851). “Kilrush Union: Copy of a Rep. made to the Poor Law Commissioners by Mr. Lucas, Temporary Inspector in charge of the Kilrush Union, contained in a Letter signed ‘S. Godolphin Osborne,’ which appeared in the ‘Times’ Newspaper on the 31st day of March 1851.” H.C. , vol. 19, 271-278. BPP (1849). “Reports and Returns Relating to Evictions in the Kilrush Union; 1849.” H.C. , vol. 49, 315. Brewer, Elizabeth. “Morris and the ‘Kingsley Movement.’” Journal of William Morris Studies 4.2 (1980): 4-17. Burke, John and John Bernard Burke. A Genealogical and Heraldic dictionary of the Landed Gentry of Great Britain and Ireland. 2 vols. London: Henry Colburn, 1847. Burney, Fanny. Journals and Letters of Fanny Burney. Vol. 4. Betty Rizzo, ed. Québec: McGill-Queen’s UP, 2003. Byron, George Gordon. The Works of Lord Byron: Letters and Journals. Vol. 1. Rowland E. Prothero, ed. London: John Murray, 1898. ---. The Works of Lord Byron: Letters and Journals. Vol. 6. Rowland E. Prothero, ed. London: John Murray, 1901. Caird, James. The Plantation Scheme; Or, the West of Ireland as a field of Investment. Edinburgh: William Blackwood & Sons, 1850. Carlyle, Thomas. Reminiscences of My Irish Journey in 1849. J[ames] A[nthony] Froude, ed. NY: Harper & Brothers, 1882. Chapman, John Stuart. Byron and the Honourable Augusta Leigh. New Haven: Yale UP, 1975. Colbert, Benjamin. Editor. Travel Writing and Tourism. NY: Palgrave Macmillan, 2012. Coleridge, Samuel Taylor. Biographia Literaria, Or, Biographical Sketches of My Literary Life and Opinions. Ed. James Engell and W. Jackson Bate. Princeton: Princeton UP, 1983. Comerford, Vincent. “Grievance, Scourge or Shame? The Complexity of Attitudes to Ireland’s Great Famine.” Holodomor and Gorta Mór: Histories, Memories and Representations of Famine. Christian Noack, Lindsay Janssen, Vincent Comerford, eds. London: Anthem Press, 2012: 51-76. “Condition of Ireland: Illustrations of the New Poor Law.” The Illustrated London News. 403 (Dec. 15, 1849): 393-4. “Condition of Ireland: Illustrations of the New Poor Law.” The Illustrated London News. 404 (Dec. 22, 1849): 404. “Condition of Ireland: Illustrations of the New Poor Law.” The Illustrated London News. 405 & 406 (Dec. 29, 1849): 443. “Condition of Ireland: Illustrations of the New Poor Law.” The Illustrated London News.407 (Jan. 5, 1850): 3. “Condition of Ireland: Illustrations of the New Poor Law.” The Illustrated London News. 409 (Jan. 19, 1850): 35. “Condition of Ireland: Illustrations of the New Poor Law.” The Illustrated London News. 410 (Jan. 26, 1850): 51. “Condition of Ireland: Illustrations of the New Poor Law.” The Illustrated London News. 412 (Feb. 9, 1850): 92. Coogan, Tim Pat. The Famine Plot: England’s Role in Ireland’s Greatest Tragedy. NY: St. Martin’s Press, 2012. Cook, Edward. The Life of Florence Nightingale. 2 vols. London: Macmillan, 1913. Cooke, John. Handbook for Travellers in Ireland. London: Edward Stanford, 1902. Crawford, Margaret. “The Great Irish Famine 1845-9: Images Versus Reality.” Ireland into History. Brian P. Kennedy and Raymond Gillespie, eds. Dublin: Town House, 1994: 75-88. Cronwell, Judith Lissauer. Florence Nightingale, Feminist. Jefferson: McFarland, 2013. Crossman, Virginia. Poverty and the Poor Law in Ireland 1850-1914. Liverpool: Liverpool UP, 2013. Cunningham, George Godfrey. Lives of Eminent and Illustrious Englishmen, from Alfred the Great to the Latest Times, On an Original Plan. Vol. 7 part 1. Glasgow: A. Fullarton & Co., 1836. Curtis, L. P. Apes and Angels: The Irishman in Victorian Caricature. Washington: Smithsonian Institution Press, 1971. De Vere, Aubrey [Thomas]. English Misrule and Irish Misdeeds: Four Letters Addressed to an English Man of Parliament. London: J. Murray, 1848. Dilke, Charles Wentworth. The Papers of a Critic: Selected Writings of the Late Charles Wentworth Dilke. 2 vols. Charles Wentworth Dilke, ed. London: John Murray, 1875. Dinneen, Rev. Patrick S[tephen]. Ed. Foclóir Gaeoilse Agus Béarla: An Irish-English Dictionary. Dublin: Irish Texts Soc., 1904. Ditchfield, P[eter] H[ampson]. The Old-Time Parson. London: Methuen & Co., 1908. Douglas, Ken. The Downfall of the Spanish Armada in Ireland: The Grand Armada Lost on the Irish Coast 1588. Dublin: Gill & Macmillan, Ltd., 2009. Duffy, Charles Gavan. Four Years of Irish History. 1845-1849. A Sequel to “Young Ireland.” London: Cassell, Petter, Galpin, & Co., 1883. Duggan, G. C. The Stage Irishman: A History of the Irish Play and Stage Characters from the Earliest Times. NY: Benjamin Blom, 1969. Dunlop, Robert. Life of Henry Grattan. London: W. H. Allen & Co., 1889. Dunn, Mary Lee. Ballykilcline Rising: From Famine Ireland to Immigrant America. Amherst: U Massachusetts Press, 2008. Dwyer, Kevin. Ireland—The Inner Island: A Journey through Ireland’s Inner Waterways. London: Collins Press, 2000. East, John. Glimpses of Ireland in 1847. London: Hamilton, Adams, & Co., 1848. Eden, Emily. Miss Eden’s Letters. Violet Dickinson, ed. London: Macmillan & Co., 1919. Eden, William. The Journal and Correspondence of William, Lord Auckland. Robert John Eden and George Hogge, eds. London: Richard Bentley, 1861. ---. Principles of Penal Law. London: B. White, 1771. ---. Substance of the Speech of Lord Auckland: In the House of Peers, April 11, 1799, On the Proposed Address to His Majesty, Respecting the Resolutions Adopted by the Two Houses of Parliament, as the Basis of an Union Between Great Britain and Ireland. London: J. Wright, 1799. Edgeworth, Maria. Castle Rackrent. New York: W. W. Norton, 2015. Edmond, Rod. “‘Without the Camp’: Leprosy and Nineteenth-Century Writing.” Victorian Literature and Culture. 29.2 (2001): 507-518. Fahy, Edward. “Performance of a Group of Sea-Trout Rod Fisheries, Connemara, Ireland.” Fish Mgmt 9.1 (1978): 22-31. Farrell, Michael. “‘This Horrible Spectacle’: Visual and Verbal Sketches of the Famine in Skibbereen.” Rhetorics of Display. Lawrence J. Prelli, ed. Columbia: University of South Carolina Press, 2006: 66-89. Fegan, Melissa. Literature and the Irish Famine 1845-1919. Oxford: Oxford UP, 2002. ---. “‘The Tottering, Fluttering, Palpitating Mass’: Power and Hunger in Nineteenth-Century Literary Responses to the Great Famine.” Ireland’s Great Famine and Popular Politics. Edna Delaney and Breandán Mac Suibhne, eds. NY: Routledge, 2016. Fingall, Countess [Elizabeth Mary] and Pamela Hinkson. Seventy Years Young: Memories of Elizabeth, Countess of Fingall. London: Collins, 1937. Fitzpatrick, David. “Famine, Entitlements and Seduction: Captain Edmond Wynne in Ireland, 1846-1851.” English Historical Review 110.437 (1995): 596-619. Flood, Jeanne A. “The Forster Family in the Irish Famine.” Quaker History 84.2 (1995): 116-130. Forbes, John B. Memorandums of a Tour in Ireland in the Autumn of 1852. 2 vols. London: Smith, Elder, & Co., 1853. Foster, Roy F. Paddy and Mr. Punch: Connections in Irish and English History. London: Penguin, 1993. Foster, Thomas Campbell. Letters on the Condition of the People of Ireland: Reprinted, By Permission, With Additional and Copious Notes, from “The Times” Newspaper. London: Chapman & Hall, 1846. Foucault, Michel. The Birth of the Clinic: An Archaeology of Medical Perception. A. M. Sheridan Smith, trans. NY: Vintage, 1975. ---. Discipline and Punish: The Birth of the Prison. Alan Sheridan, trans. NY: Vintage, 1979. ---. Madness and Civilization: A History of Insanity in the Age of Reason. Richard Howard, trans. NY: Vintage, 1988. Franklin, Rene and Roisín Berry. The Vandeleur Photographic Collection. Ennis: County Clare Council, 2007. Froude, James Anthony. Thomas Carlyle: A History of His Life in London, 1834-1881. 2 vols. NY: Harper & Brothers, 1885. “Galway.” The Encyclopaedia Britannica. Thomas Spencer Baynes, ed. NY: Charles Scribner’s Sons, 1879: 55-58. Garrard, Ian and David Streeter. The Wild Flowers of the British Isles. Oakton: Midsummer Books, 1998. Gaskell, Elizabeth. Mary Barton. Oxford: Oxford UP, 1987. Geldart, Mrs. Thomas [Hannah Ransome]. Memorials of Samuel Gurney. London: W. & F. G. Cash, 1857. Gray, Peter. Famine, Land and Politics: British Government and Irish Society 1843-1850. Dublin: Irish Academic Press, 1999. Grayson, Donald K. “Differential Mortality and the Donner Party Disaster.” Evolutionary Anthropology 2.5 (1993): 151-159. Gregory, Augusta. Poets and Dreamers: Studies and Translations from the Irish. Cambridge: Cambridge UP, 2010. Griffin, Gerald. The Collegians: A Tale of Garryowen. NY: P. J. Kennedy, Excelsior Catholic Pub. House, 1896. Grosskurth, Phyllis. Byron: The Flawed Angel. NY: Houghton Mifflin Co., 1997. Gunn, Peter. My Dearest Augusta: A Biography of the Honourable Augusta Leigh, Lord Byron’s Half-Sister. London: Bodley Head, 1968. Haines, Robin. Charles Trevelyan and the Great Irish Famine. Dublin: 4 Courts Press, 2004. Hall, S[amuel] C[arter] and [Anna Maria]. Ireland: Its Scenery, Character, &c. 3 vols. London: How & Parsons, 1841-1843. Hall, Spencer T[imothy]. Life and Death in Ireland, As Witnessed in 1849. Manchester: J. T. Parkes, 1850. Hamlin, Christopher. Public Health and Social Justice in the Age of Chadwick: Britain, 1800-1854. Cambridge: Cambridge UP, 1998.Handbook for Travellers in Ireland: With Travelling Maps. London: John Murray, 1864. Hardiman, James. The History of the Town and County of the Town Galway: From the Earliest Period to the Present Time. Galway: Kennys Bookshops and Art Galleries, 1975. Harford, Judith. “Women and the Irish University Question.” Have Women Made a Difference? : Women in Irish Universities, 1850-2010. Judith Harford & Claire Rush, eds. Oxford: Peter Lang, 2010: 7-28. Head, Francis Bond. A Fortnight in Ireland. London: John Murray, 1852. Heaney, Seamus. Opened Ground: Selected Poems 1966-1996. NY: Farrar, Straus & Giroux, 1998. Henry, William. Famine: Galway’s Darkest Years. Cork: Mercier Press, 2011. Hicks, David. Irish Country Houses: A Chronicle of Change. Cork: The Collins Press, 2012. Hitchcock, Tim. “Begging on the Streets of Eighteenth-Century London.” Journal of British Studies 44.3 (2005): 478-98. Hooper, Glenn. The Tourist’s Gaze: Travellers to Ireland 1800-2000. Cork: Cork UP, 2001. ---. Travel Writing and Ireland, 1760-1860. NY: Palgrave Macmillan, 2005. [Howard, Evans]. Noblesse Oblige. Our Old Nobility. London: The Political Tract Society, 1879. Inglis, Henry D[avid]. Ireland in 1834: A Journey throughout Ireland During the Spring, Summer, and Autumn of 1834. 2 vols. London: Whittaker & Co., 1835. Jackson, John Wyse and Peter Costello. John Stanislaus Joyce: The Voluminous Life and Genius of James Joyce’s Father. NY: St. Martin’s Press, 1998. Johnson, Joan. James and Mary Ellis in Letterfrack 1849-1857. Dublin: Historical Committee of the Religious Society of Friends in Ireland, 2000. Joyce, James. Ulysses. NY: Modern Library, 1961. Judd, Catherine [Nealy]. Bedside Seductions: Nursing and the Victorian Imagination, 1830-1880. NY: St. Martin’s Press, 1998. Junius. The Genuine Letters of Junius. To Which Are Prefixed Anecdotes of the Author. George Brady Woodfall, ed. London: Piccadilly, 1771. Kelleher, Margaret. The Feminization of Famine: Expressions of the Inexpressible?. Cork: Cork UP, 1997. ---. “Tá mé ag imeacht’: The Execution of Myles Joyce and its Afterlives.” The Body in Pain in Irish Literature and Culture. Fionnuala Dillane, Naomi McAreavey, Emilie Pine, eds. NY: Palgrave Macmillan, 2016: 99-116. Kelly, Seán. “Foundation of the Newcastle West Workhouse.” The Annual Observer 5 (1984): 151-2. Kinealy, Christine. Charity and the Great Hunger in Ireland: The Kindness of Strangers. London: Bloomsbury, 2013. King, Jason. “Remembering Famine Orphans: The Transmission of Famine Memory Between Ireland and Quebec.” Holodomor and Gorta Mór: Histories, Memories and Representations of Famine. Christian Noack, Lindsay Janssen, Vincent Comerford, eds. London: Anthem Press, 2012: 120-144. Kingsley, Charles. The Water-Babies: A Fairy Tale for a Land-Baby. London: Macmillan, 1891. Kreilkamp, Vera. The Anglo-Irish Novel and the Big House. Syracuse: Syracuse UP, 1998. Lang, R[obert] T[urnbull]. Black’s Guide to Ireland. London: Adam and Charles Black, 1906. Larkin, Emmet. The Pastoral Role of the Roman Catholic Church in Pre-Famine Ireland, 1750-1850. Dublin: 4 Courts Press, 2006. Leech, John. A Little Tour of Ireland: Being a Visit to Dublin, Galway, Connamara, Athlone, Limerick, Killarney, Glengarriff, Cork, etc. etc. etc. London: Bradbury & Evans, 1859. Lengel, Edward G. The Irish Through British Eyes: Perceptions of Ireland in the Famine Era. Westport: Greenwood Pub. Group, 2002. “Letter from Loughrea.” Galway Mercury (March 8 1847): n.p. Lever, Charles. The Martins of Cro’ Martin. 3 vols. London: George Routledge and Sons, 1872. ---. “Twaddling Tourists in Ireland.” Dublin University Magazine 24 (Nov 1844): 505-26. Lewis, Samuel. A Topographical Dictionary of Ireland, Comprising the Several Counties, Cities, Boroughs, Corporate, Market, and Post Towns, Parishes, and Villages, with Historical and Statistical Descriptions. 2 vols. London: S. Lewis, 1837. Liddle, Dallas. “Salesmen, Sportsmen, Mentors: Anonymity and Mid-Victorian Theories of Journalism.” Victorian Studies 41.1 (1997): 31-68. Logan, Deborah A[nna]. Harriet Martineau, Victorian Imperialism, and the Civilizing Mission. Farnham: Ashgate, 2010. Lowe, W. J. “Policing Famine Ireland.” Eire-Ireland 29.4 (1994): 47-67. MacDougall, Hugh A. Racial Myth in English History: Trojans, Teutons, and Anglo-Saxons. Montreal: Harvest House, 1982. MacIntyre, Angus. The Liberator: Daniel O’Connell and the Irish Party 1830-1847. London: Hamish House, 1965. Manners, John [James Robert]. Notes of an Irish Tour in 1846. London: J. Ollivier, 1849. Mansergh, Nicholas. The Irish Free State—Its Government and Politics. NY: Macmillan, 1934. Mapother, E[dward] D[illon]. “Address in Public Medicine.” The British Medical Journal 2.1338 (1886): 349-356. Martin Bell, [Mary Letitia]. Julia Howard: A Romance. London: Richard Bentley, 1850. Martineau, Harriet. Harriet Martineau and the Irish Question: Condition of Post-Famine Ireland. Deborah Anna Logan, ed. Bethlehem: Lehigh UP, 2012. ---. Letters from Ireland. London: J. Chapman, 1852. McClaughlin, T. Barefoot and Pregnant? : Irish Famine Orphans in Australia. Melbourne: Genealogical Soc. of Victoria, 1991. McCourt, John. Writing the Frontier: Anthony Trollope between Britain and Ireland. Oxford: Oxford UP, 2015. McDonald, Lynn. Mary Seacole: The Making of the Myth. Toronto: Iguana Books, 2014. McNeill, William H. “The Introduction of the Potato into Ireland.” The Journal of Modern History 21.3 (1949): 218-22. McVeagh, John. Irish Travel Writing: A Bibliography. Dublin: Wolfhound Press, 1996. Meloy, Elizabeth. “Touring Connemara: Learning to Read a Landscape of Ruins, 1850-1860.” New Hibernia Review 13.3 (2009): 21-46. Mitchel, John. The Crusade of the Last Period: And Last Conquest of Ireland (Perhaps). Glasgow: Cameron & Ferguson, 1876. Mort, Frank. Dangerous Sexualities: Medico-Moral Politics in England Since 1830. NY: Routledge & Kegan Paul, 1987. “Movements of Ocean Steamers.” The New York Times. June 23, 1861. n.p. Murphy, Maureen O’Rourke. Compassionate Stranger: Asenath Nicholson and the Great Irish Famine. Syracuse: Syracuse UP, 2015. Edition. Anngret Simms and H. B. Clarke, eds. Dublin: Royal Irish Academy: 1-16. [Neale, John Preston]. Jones’ Views of the Seats, Mansions, Castles, Etc. of Noblemen and Gentlemen in England. London: Jones & Co., . Neave, Richard Digby. Four Days in Connemara. London: Richard Bentley, 1852. Newel, Timothy. “From Our Own Correspondent: The Famine.” The Times 19487 (March 3 1847): 6. Nicholson, A[senath Hatch]. Annals of the Famine in Ireland, In 1847, 1848, and 1849. NY: E. French, 1851. ---. Ireland’s Welcome to the Stranger or An Excursion through Ireland in 1844 and 1845 For the Purpose of Personally Investigating the Condition of the Poor. NY: Baker & Scribner, 1847. Nightingale, Florence. Florence Nightingale: Letters from the Crimea 1854-1856. Sue M. Goldie, ed. Manchester: Mandolin Press, 1997. Ó Gráda, Cormac. Black ‘47 and Beyond: The Great Irish Famine in History, Economy, and Memory. Princeton: Princeton UP, 1999. Ó Murchadha, Ciarán. Figures in a Famine Landscape. London: Bloomsbury, 2016. ---. Sable Wings Over the Land: Ennis, County Clare and its Wider Community During the Great Famine. CLASP Press, 1998. O’Brien, Lucius. Ireland in 1848: The Late Famine and the Poor Laws. London: Hatchard & Son, 1848. O’Connell, Mrs. Morgan John [Mary Anne Bianconi]. Charles Bianconi: A Biography. London: Chapman & Hall, 1878. O’Farrell, Patrick. The Irish in Australia: 1788 to the Present. Notre Dame: Notre Dame UP, 2000. O’G. “The Irish Funeral Cry: The Ullaloo, Keeners and Keening.” The Dublin Penny Journal 1.31 (26 Jan 1833): n.p. O’Malley, Eoin. “The Decline of Irish Industry in the Nineteenth Century.” The Economic and Social Review. 13.1 (1981): 21-42. O’Malley, Owen. “Peter Frederic O’Malley.” For the Fourth Generation. Martin Sheppard, ed. Leicester: Troubador, 2017: 132-140. Osborne, Francis. “Francis Osborne, Duke of Leeds Letters: Hampstead and Grosvenor Square, to Lady Camarthan 1778 Dec 21-1779 Ap. 4.” Yale University, Lewis Walpole Library Mss File 87. “Osborne Homecoming.” Poole Herald (Jan 1855). n.p. Osborne, Sidney Godolphin. “Condition of the Peasantry in the West of Ireland.” The Times 20543 (Jul 17 1850): 5. ---. “The Condition of the West of Ireland.” The Times 20526 (Jun 27 1850): 8. ---. “The Condition of the West of Ireland.” The Times 20550 (Jul 25 1850): 7. ---. “Death in Ireland.” The Times 20744 (Mar 8 1851): 5. ---. “To the Editor of The Times.” The Times 20622 (Oct 17 1850): 5. ---. “To the Editor of The Times.” The Times 20755 (Mar 21 1851): 5. ---. Gleanings in the West of Ireland. London: T. & W. Boone, 1850. ---. Hints to the Charitable: Being Practical Observations on the Proper Regulation of Private Charity: Intended Principally for the Use of Those Who Take an Active Interest in Village Economy. T. & W. Boone, 1838. ---. “Immortal Sewerage.” Meliora: or, Better Times to Come: Being the Contributions of Many Men Touching the Present State and Prospects of Society. Viscount Ingestre [Charles John Chetwynd-Talbot], ed. London: John W. Parker & Son, 1853: 7-17. ---. “In-Door Relief-Ireland.” The Times 20538 (Jul 11 1850): 8. ---. “Ireland and Corn Lifting.” The Times 203004 (Oct 11 1849): 5. ---. “[Irish Charities].” The Times 20237 (Jul 25 1849): 6. ---. “Irish Deaths-Burial-Eviction.” The Times 20674 (Dec 17 1850): 5. ---. “Irish Emigrants.” The Times 20734 (Feb 25 1851): 6. ---. “The Kilrush Uniion.” The Times 20763 (Mar 31 1851): 5. ---. Lady Eva: Her Last Days. London: T. & W. Boone, 1951. ---. “Letter.” The Fleet Papers: Being the Letters to Thomas Thornhill, Esquire, of Riddlesworth, in the County of Norfolk from Richard Oastler, His Prisoner in the Fleet with Occasional Communications from Friends. Richard Oastler, Thomas Thornhill, and James Robert George Graham. London: J. Pavey, 1844: 502-4. ----. The Letters of S.G.O. ; A Series of Letters On Public Affairs Written by the Rev. Lord Sidney Godolphin Osborne and Published in The Times 1844-1888. 2 vols. Arnold White, ed. London: Griffith, Farran, Okeden & Welsh, 1891. ---. “Lord Lucan and Property in Mayo.” The Times 20335 (Nov 16 1849): 3. ---. “The Queen’s Visit.” The Times 20261 (Aug 20 1849): 4. ---. The Respective Duties of Landlords, Tenants, and Labourers: An Address Delivered to a Farmer’s Club, by the Hon. & Rev. Lord Sidney G. Osborne. Published by Request. London: James Ridgway, 1861. ---. Scutari and its Hospitals. London: Dickinson Bros., 1855. ---. “The State of Ireland.” The Times 20223 (Jul 9 1849): 4. ---. View of the Low Moral and Physical Conditions of Agricultural Labourers. London: T. & W. Boone, 1844. ---. A Word or Two about the New Poor Law, by a Beneficed Clergyman. London: c. 1834. ---. “The Working of the Irish Poor Law.” The Times 20202 (Jun 14 1849): 5. ---. “The Working of the Irish Poor Law.” The Times 20208 (Jun 21 1849): 5. ---. “The Working of the Irish Poor Law.” The Times 20220 (Jul 5 1849): 5. Osborne, W[illiam] G[odolphin]. The Camp and Court of Runjeet Sing: with an Introductory Sketch of the Origin and Rise of the Sihk State. London: Henry Colburn, 1840.Papers Related to Proceedings for the Relief of the Distress, and State of Unions and Workhouses, in Ireland. Dublin: Alexander Thom, 1849. Parlby, Fanny Parkes. Wanderings of a Pilgrim, in Search of the Picturesque, During Four-and-Twenty Years in the East; with Revelations of Life in the Zenāna. 2 vols. London: Pelham Richardson, 1850. Penrose, Jr., Walter Duvall. Postcolonial Amazons: Female Masculinity and Courage in Ancient Greek and Sanskrit Literature. Oxford: Oxford UP, 2016. “Postscript.” The Spectator (March 24 1855): 9. “Report Upon the Recent Epidemic Fever in Ireland.” Dublin Quarterly Journal of Medical Science. 8.1 (Aug 1849): 1-86. Robbins, Bruce. The Servant’s Hand: English Fiction from Below. Durham: Duke UP, 1993. Roberts, F. David. Paternalism in Early Victorian England. New Brunswick: Rutgers UP, 1979. ---. The Social Conscience of the Early Victorians. Stanford: Stanford UP, 2002. Roberts, M. J. D. “Reshaping the Gift Relationship: The London Mendicity Society and the Suppression of Begging in England, 1816-69.” International Review of Social History 36 (1991): 201-31. Robinson, Tim. Listening to the Wind. Dublin: Penguin, 2007. Scanlan, Senan. “West and South Clare Newspaper Notes from c. 1800-1950.” n.p., 2016. Scrope, George Poulett. Draft Report Proposed to the Select Committee of the House of Commons in the Kilrush Union. London: James Ridgway, 1850. Shovlin, Frank. Journey Westward: Joyce, Dubliners and the Literary Revival. Liverpool: Liverpool UP, 2012. Sloan, Robert. William Smith O’Brien and the Young Ireland Rebellion of 1848. Dublin: Four Courts Press, 2001. Smith, William Henry. A Twelve Months’ Residence in Ireland, during the Famine and the Public Works, 1846 and 1847. London: Longman, Brown, Green & Longman, 1848. Smyth. George Lewis. The Monuments and Genii of St. Paul’s Cathedral and of Westminster Abbey; With Historial Sketches and Descriptions of Both Churches: Forming an Entirely New and Correct Biography of All That is Interesting. London: John Williams, 1826. Somerville, Alexander. Letters from Ireland During the Famine of 1847. Ed. K[eith] D. M. Snell. Dublin: Irish Academic Press, 1994. Stanford, Jane. That Irishman: The Life and Times of John O’Connor Power. Charleston: The History Press, 2011. Stanmore, Arthur Hamilton-Gordon. Sidney Herbert: Lord Herbert of Lea, a Memoir. 2 vols. London: John Murray, 1906. Stearns, Marshall W. “Robert Henryson and the Leper Cresseid.” Modern Language Notes. 59.4 (1944): 265-69.The Census of Ireland for the Year 1861, Part 1: Showing the Area, Population, and Number of Houses by Townlands and Electoral Divisions: County and Town of Galway. Vol. 4. Dublin: Alexander Thom, 1863. Timpson, Thomas. Memoirs of Mrs. Elizabeth Fry. NY: Stanford & Swords, 1847. Tipping, H[enry] Avray. In English Homes: The Internal character, Furniture and Adornments of Some of the Most Notable Houses of England Accurately Depicted from Photographs Specially Taken by Charles Latham. 2 vols. London: Country Life, 1908. Trollope, Anthony. Castle Richmond. Oxford: Oxford UP, 1989. ---. The Kellys and O’Kellys, or, Landlords and Tenants. Whitefish: Kessinger, 2017. ---. The Macdermots of Ballycloran. 2 vols. NY: Garland, 1979. Tuke, James H[ack]. A Visit to Connaught in the Autumn of 1847: A Letter Addressed to the Central Relief Committee of the Society of Friends, Dublin, with Notes of a Subsequent Visit to Erris. London: Charles Gilpin, 1848. Urban, Sylvanus. The Gentleman’s Magazine. Vol. 33. London: John Bowyer, 1850. Vandeleur, Crofton M. “To the Editor of The Times.” The Times 20752 (Mar 18 1851): 7. Villiers-Tuthill, Kathleen. History of Kylemore Castle and Abbey. Kylemore: Kylemore Abbey Pub., 2002. Warhol, Robyn R. “Toward a Theory of the Engaging Narrator: Earnest Interventions in Gaskell, Stowe, and Eliot.” PMLA 101.5 (1986): 811-18. West, Mrs. Frederic [Theresa Cornwallis]. A Summer Visit to Ireland in 1846. London: Richard Bentley, 1847. White, Arnold. “Introduction.” The Letters of S. G. O.; A Series of Letters on Public Affairs Written By the Rev. Lord Sidney Godolphin Osborne and Published in the Times, 1844-1888. 2 Vol. Sidney Godolphin Osborne. Arnold White, ed. London: Griffith, Farran, Okeden & Welsh, 1890: ix-xxiv. White, George Preston. A Tour in Connemara, With Remarks of its Great Physical Capabilities. London: W. H. Smith & Son, 1849. Wilde, William R[obert]. Lough Corrib: Its Shores and Islands; With Notices of Lough Mask. Dublin: McGlashan & Gill, 1872. Williams, Leslie A. Daniel O’Connell, the British Press and the Irish Famine: Killing Remarks. William H. A. Williams, ed. Aldershot: Ashgate, 2003. ---. “Irish Identity and the Illustrated London News 1846-1851: Famine to Depopulation.” Representing Ireland: Gender, Class, Nationality. Susan Shaw Sailer, ed. Gainesville: University Press of Florida, 1997: 59-93. Williams, William H. A. Creating Irish Tourism: The First Century, 1750-1850. London: Anthem Press, 2010. ---. Tourism, Landscape, and the Irish Character: British Travel Writers in Pre-Famine Ireland. Madison: U Wisconsin P, 2008. Wohl, Anthony S. Endangered Lives: Public Health in Victorian Britain. London: J. M. Dent, 1983. Woodham-Smith, Cecil. The Great Hunger: Ireland 1845-1849. NY: Harper & Row, 1962. ---. The Reason Why. London: Constable, 1970. “Workhouse Barbarity: To S. G. O.” A Fortnight in Ireland. Francis Bond Head. London: John Murray, 1852: 347-9. “Wreck of the Emigrant Barque ‘Edmond’ of London from Limerick, at Kilkee: Awful Loss of Ninety-Six Lives!! !” Limerick Reporter 22 (Nov 1850): n.p. This work will appeal to the general reader who has an interest in 19th-century Irish studies, particularly Irish Famine studies, as well as those who are interested in nineteenth-century British medical history. Academic specialists who would find this text useful include those who specialize in; Irish Studies; History of Medicine; Famine Studies; Church of England historians; Victorianists; travel narrative specialists; those who study Victorian workhouses.